1. What are you currently reading? Calico Joe. This Grisham baseball novel was a surprise giftie from my aunt, who knows how I love my Cubs (who are -- knock wood -- headed for the playoffs this season!). Grisham also loves the Cubs and the game. It's a leisurely paced, lovely little book. Bonus: some of it is set in Arkansas, a part of the country I developed affection for during my spa trips to Hot Springs. 2. What did you just finish reading? Being Nixon by Evan Thomas. Far more emotionally engaging, and emotionally taxing, than I expected. Yes, he was paranoid and vindictive and opportunistic and very comfortable spewing anti-Semitic rhetoric. But he was also patriotic, committed to creating a peaceful global community and touchingly, unexpectedly optimistic. My favorite moment is the one Thomas quotes more than once. As guests would slip out of a White House screening because they'd given up on the movie, Nixon would stop them and encourage them to stay. "Wait! It'll get better!" That was his attitude after every setback (even and especially the tragic ones he engineered). I expected to be repulsed by him, and frequently I was. I didn't expect to be touched by him, and frequently I was. 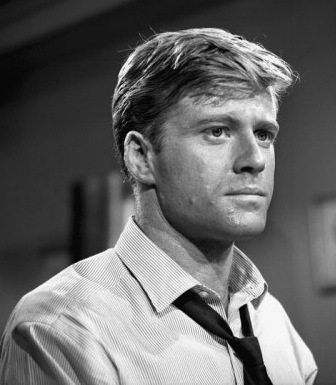 So tonight I'm in front of the TV, just spinning the dial, and look who I come upon: Robert Redford at age 25. He has a pivotal but still supporting role in an episode of The Alfred Hitchcock Hour, billed after Gig Young and Martha Hyer. Considering the time I spent taking A Walk in the Woods with him this past Sunday, it was fascinating to see him at the beginning of his career, 53 years ago. In 1962, Gig Young was a star who moved smoothly back and forth between movies and TV. At the time of this episode, he was married to a promising actress named Elizabeth Montgomery (yes, Samantha from Bewitched). In a few years he would win an Oscar for They Shoot Horses, Don't They? -- the film that paired him with one of Redford's frequent leading ladies (Jane Fonda) and favorite directors (Sydney Pollack). Then he drank himself out of a career and died of his own hand in a hideous murder-suicide when in his 60s. Today Gig Young isn't relevant at all, and this past weekend, 78-year-old Redford scored at the box office. A lot of it has to be luck and timing. But I think it's also think it's intelligence, taste and stubbornness. There are so many Hollywood tragedies, like Gig Young. It must take serious tenacity and drive to survive and thrive. Good for you, Sundance. Good for you. I had staff. I wish I had people. Someone to make my dinner, handle my bills and other paperwork, and clean my house.